Safely and securely keep daily essentials close at hand with the Vive walker bag. 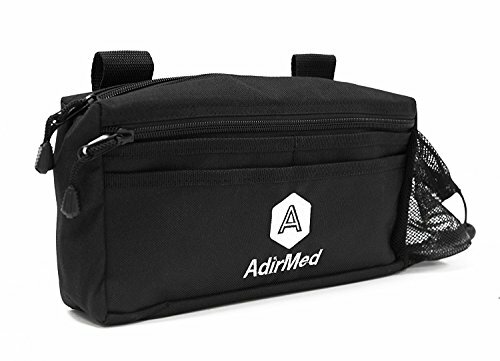 Adjusting to attach to all walker sizes and styles, the walker bag has a large zippered compartment to store medical supplies, a change of clothes, electronics and other items. Three easy access pockets line the front of the durable, yet lightweight walker bag. 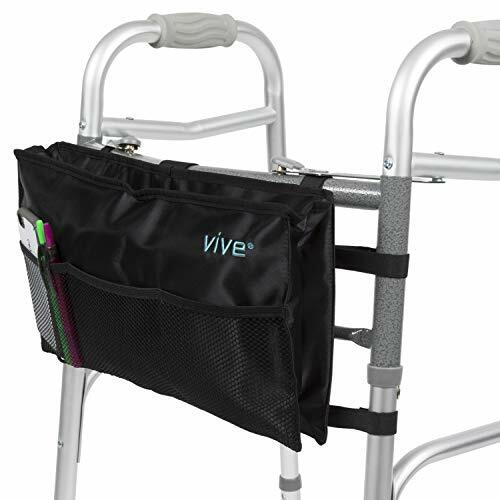 Adjustable loop fasteners allow the Vive walker bag to easily attach to the front of any walker style and size, including bariatric walkers, standard walkers and dual-point foldable walkers. Easily and securely keep essentials at hand with the large inner compartment with a zippered closure. The sturdy nylon bag can hold a purse, a change of clothes, or necessary medical supplies. Three convenient outer pockets provide easy access to everyday items such as drinks and snacks, glasses, electronic devices and more. Heavy duty fastening material securely holds the walker bag in place. Seven individual loops are reinforced for a durable accessory bag that easily attaches to any walker. Constructed with a durable, lightweight material, the versatile walker accessory tote bag is water-resistant to keep contents safe and dry. The durable material is machine washable for added convenience. For best results, machine wash in cold water and allow bag to air dry. 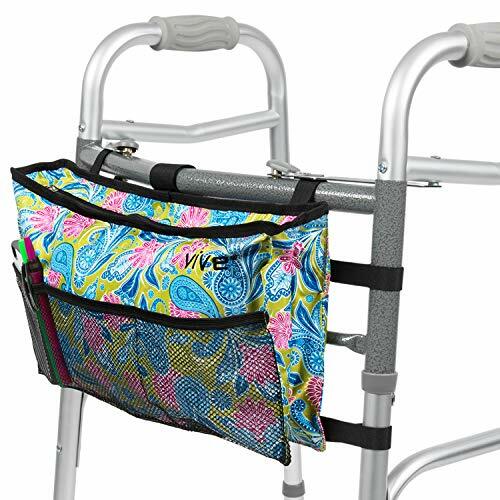 FITS ALL WALKER STYLES: Adjustable loop fasteners allow the Vive walker bag to easily attach to the front of any walker style and width, including bariatric walkers, standard walkers and dual-point folding walkers. HANDS FREE GRAB AND GO BAG: Easily keep essentials at hand with the large inner compartment with a secure zippered closure. The sturdy nylon bag can hold a purse, a change of clothes, or necessary medical supplies. Three convenient outer pockets provide easy access to everyday items such as drinks and snacks, glasses, electronic devices and more. SECURELY ATTACHES WITH STRONG FASTENER LOOPS: Heavy duty fastening material securely holds the walker bag in place. Seven individual loops are reinforced for a durable accessory bag that easily attaches to any walker. LIGHTWEIGHT WATER-RESISTANT AND MACHINE WASHABLE: Constructed with a durable, lightweight material, the versatile walker bag is water-resistant to keep contents safe and dry. The durable nylon material is machine washable for added convenience. For best results, machine wash in cold water and allow bag to air dry. Water Resistant walker bag is a mobility accessory that allows you to transport items with ease. It fits most walkers, rollators, wheelchairs and power scooters with adjustable length straps that are secured with clip fasteners. It is made with premium quality material that is water resistant to keep your items dry and safe. UNIVERSAL FIT: Fits most walkers, rollators, wheelchairs and scooters. WATER RESISTANT: Made from premium quality polyester to be durable and water resistant. Easy to clean. FRONT & BACK STORAGE: 8 wide pocket in front of the bag make for quick storage and a zippered compartment ideal for holding as big as a iPhone 7 Plus. 2 large mesh pockets in the back for bottle waters or extra storage. INTERIOR STORAGE: The spacious interior has a keyring holder and a slot for storing credit cards or IDs. Easy Hook & Loop Fastener closure. EXCLUSIVE NEW BRACKET is designed to fit any kneewalker. This is the perfect accessory add on if you purchased a kne scooter without a basket - like the Drive Medical DV8, Roscoe Medical ROS-KS2 Economy Knee Scooter, KneeRover Economy Knee Scooter Walker, Knee Rover GO, or the Kneerover PRO. 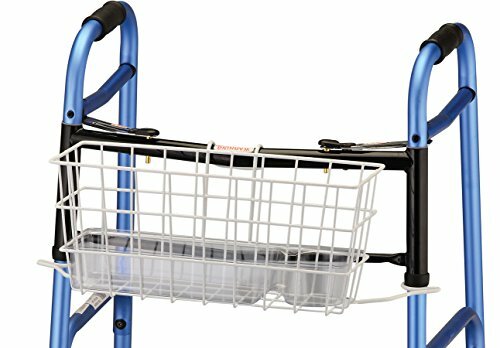 If you are looking for a replacement part, this basket will fit the following knee walkers: Blue All Terrain Knee Rover; KneeCycle knee scooter, Knee Rover HYBRID knee walker, Drive 796 Dual Pad Steerable Knee Walker and Roscoe Medical Knee Scooter. Basket easily detaches and includes ergonomic handle for easy carrying. It also easily and securely mounts to steering column of knee walker. 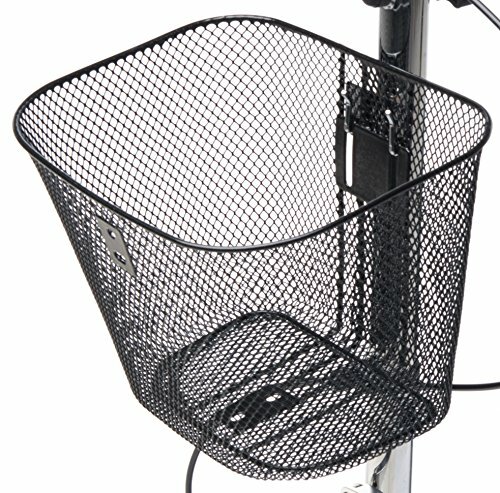 ALL NEW KNEEROVER BASKET ACCESSORY PART - NOW INCLUDES ATTACHMENT BRACKET. 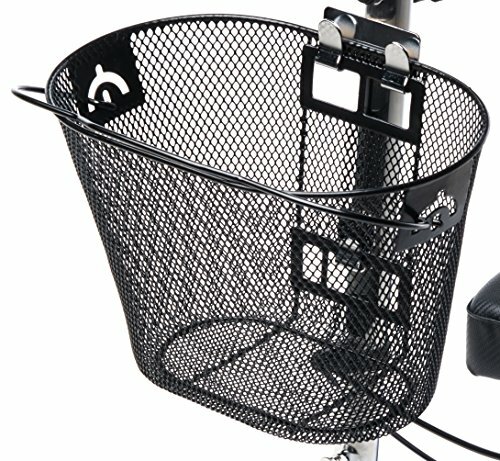 Knee Walker Wire Basket is the perfect companion for your knee scooter crutch alternative. Store and transport your personal items and valuables with ease. KNEE WALKER DOESN'T HAVE A BASKET? We have the solution!! The exclusive basket attachment bracket is designed to fit most knee walker steering columns, including KneeRover Economy Knee Scooter, Knee Rover GO, and the Knee Rover PRO. NEED A REPLACEMENT BASKET PART? Wire basket will fit the following knee walkers: Blue All Terrain Knee Rover; KneeCycle knee scooter, Knee Rover HYBRID knee walker, Drive 796 Dual Pad Steerable Knee Walker and Roscoe Medical Knee Scooter. Kneewalker basket is durable with weather-resistant construction. Basket easily detaches and includes ergonomic handle for easy carrying. It also easily and securely mounts to steering column of knee walker or knee scooter. 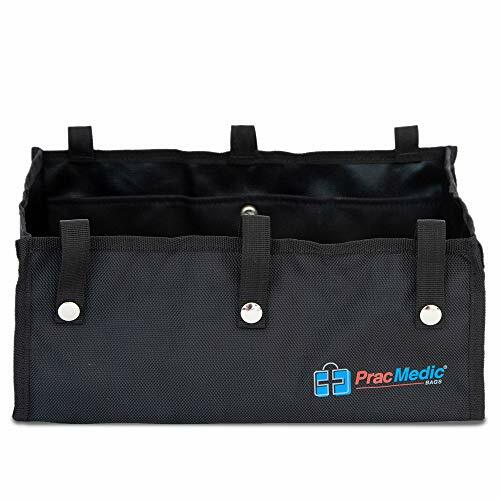 PracMedic Bags Under Seat Rollator Tote has a dimension of 12.5" Long x 8.5" Wide x 5.5" High. SUITABILITY- the dimensions of the Under Seat Rollator Tote is designed to fit most 4 Wheel Rollators but, please check it against your current tote or measure it up on your Rollator or Walker for suitability. PREMIUM QUALITY & DURABLE- made with Love. External fabric is Top of the Range Polyester 1680D material plus Sturdy PolyPropylene Base to ensure the tote holds up your shopping or essentials. 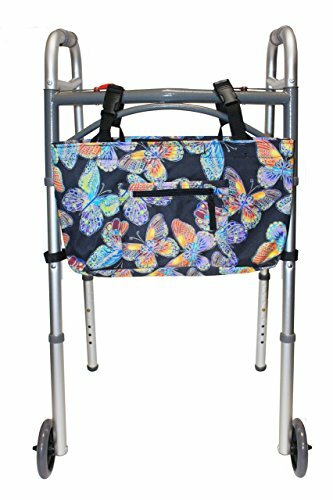 EASY to INSTALL- comes complete with Premium Quality Stud Fasteners, 3 on each side of the Tote, so you just snap it on the cross bars of the Rollator. 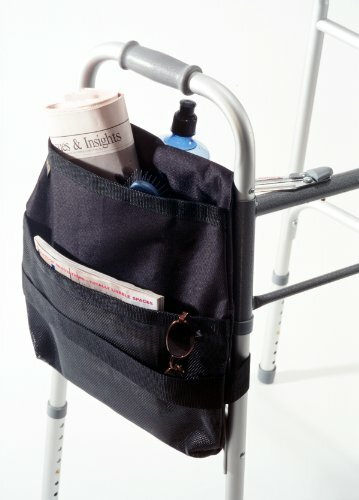 FLEXIBLE- PracMedic Under Seat Rollator Tote is flexible, so it folds up with your 4 Wheel Rollator. WATER RESISTANT- the Premium Quality Polyester 1680D fabric has PU backing, so it is water resistant to protect your essentials from unexpected wetness. WARRANTY- 6 months Limited Warranty included with registration. 100% SATISFACTION GUARANTEED- PracMedic Bags is confident you will enjoy and make the most of this Premium Quality Under Seat Rollator Tote. Drive your 4-Wheel Rollator with PracMedic Bags Under Seat Rollator Bag today! PREMIUM QUALITY - you deserve a Durable & Reliable Under Seat Tote for 4-Wheel Rollator. Rest assured, it is made with Top of the Range Polyester 1680D fabric to ensure you get the best value for your purchase. STORAGE - plenty of room to hold your essentials whilst you are out and about with your 4 Wheel Rollator. Please refer to the images for reference. PRAGMATIC - designed with Functionality in mind, so we have added 4 internal pockets to hold small items ie. wallet, mobile phone, medicine. So you can access them easily. RELIABILITY - we have added a Sturdy Base to the Under Seat Rollator Tote, so you have a peace of mind knowing your essentials are held up when needed most. The recommended load is no more than 11 pounds. WELL ENGINEERED - we love details! Every aspect of PracMedic Under Seat Roller Tote is scrutinised during the engineering process to ensure you receive a quality product that serves your needs! Side walker bag for folding walking. EASY TO CARRY AROUND: this walker pouch bag for walker side saddle has a top handle that can be carry all belongings out of folding or rollator walker with ease. Everything you need within reach! EASY CLEAN UP: can be wipe away stains easily. Must have walker accessories for seniors. Royal Medical Solutions presents this innovative walker bag that comes with a built in soft cooler that keeps your temperature controlled items cool all day long! It is a mobility accessory that allows you to transport items with ease. 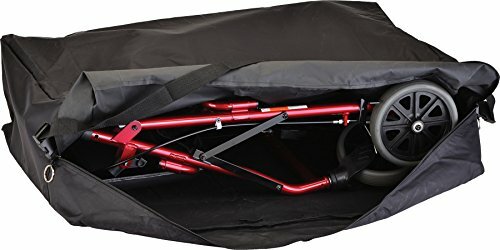 It fits most walkers, rollators, wheelchairs and power scooters with adjustable length straps that are secured with clip fasteners. It is made with premium quality material that is water resistant and temperature controlled to keep your items dry and safe. INNOVATIVE SOFT COOLER COMPARTMENT: A zippered Soft Cooler Compartment ideal for your temperature controlled items i.e. dairy, fruits, lunch meats or diabetic supplies while you enjoy outdoor activities. INTERIOR STORAGE: A separate compartment designed to include a key ring holder and a slot for storing credit cards or IDs. Easy Hook & Loop Fastener closure. FRONT STORAGE: 8W X 7D pocket in front of the bag makes for quick storage and also a zippered compartment ideal for holding a cell phone securely. BACK STORAGE: A large coffee mug or water bottle holder and 2 mesh pockets provide ample space to store your daily items. 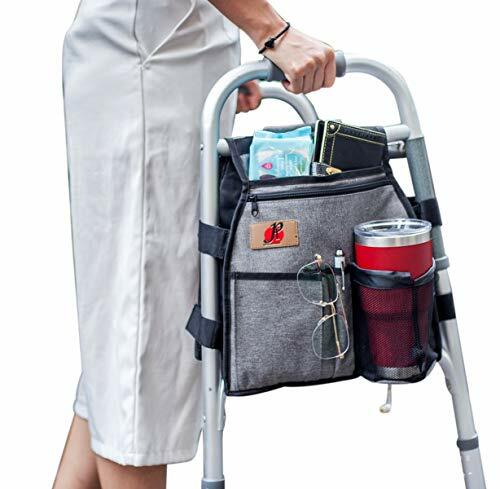 Royal Medical Solutions presents this innovative walker bag that comes with a built in soft cooler that keeps your temperature controlled items cool all day long! It is a mobility accessory that allows you to transport items with ease. It fits most walkers, rollators, wheelchairs and power scooters with adjustable length straps that are secured with clip fasteners. It is made with premium quality material that is water resistant and temperature controlled to keep your items dry and safe. Note: Dimension of the bag: 18" Wide and 10" Tall. Only walkers with 22" width or less can be accommodated. CUP HOLDER BOTTOM LINER INSERT lines the bottom of the basket so small items such as keys do not fall out of the basket and includes a cup holder to fit and hold water bottles and drinks. Cup holder insert is 3.75W x 2.24H. UNIVERSAL FIT securely fits on all folding walkers. Attachment brackets can fit on folding walker widths between 15.75 - 20 (measured between legs below front bars - See Image). EXCLUSIVE NEW BRACKET is designed to fit any kneewalker. This is the perfect accessory add on if you purchased a kne scooter without a basket - like the Drive Medical DV8, Roscoe Medical ROS-KS2 Economy Knee Scooter, KneeRover Economy Knee Scooter Walker, Knee Rover GO, or the Knee Rover PRO. KNEE WALKER DOESN'T HAVE A BASKET? We have the solution!! The exclusive basket attachment bracket is designed to fit most knee walker steering columns, including the Drive Medical DV8, Roscoe Medical ROS-KS2 Economy Knee Scooter, KneeRover Economy Knee Scooter Walker, Knee Rover GO, and the Knee Rover PRO. NEED A REPLACEMENT BASKET PART? Wire basket will fit the following knee walkers: KneeRover Green Steerable Knee Scooter; Knee Rover Evolution Seated Scooter, Healthline Trading Knee Walker, and Isokinetics Steerable Knee Walker. Kneewalker basket is durable with weather-resistant construction. 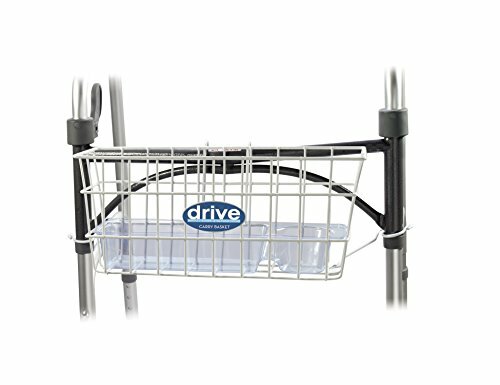 Basket easily detaches and securely mounts to steering column of knee walker or knee scooter. Original Manufacturer's Accessory Part. INCLUDES BASKET AND ATTACHMENT BRACKET. Dimensions: 11 inches x 9 inches x 8 inches. Our walker bag easily attaches to any walker with four heavy-duty Velcro strips that won t budge or unstick until you need them to. Carry practically anything with you wherever you go, like books, packages, groceries,make up and more! Our all-weather bag is designed to keep moisture out and everything safe and dry inside with three convenient mesh pockets for keeping smaller items from sinking to the bottom. Universal Fit The adjustable loops let our walker bag easily attach to the front of any walker style or size. Hands Free Grab-&-Go Bag Keep your hands on the grips of your walker and trust our lightweight, yet heavy duty walker bag to hold all you need - cell phone, wallet, lipstick, etc. Machine Washable For easy removal of pesky odors or stains, simply turn the walker bag inside out, toss it in the wash with your preferred detergent and hang to dry. Pockets Galore Don t let small items sink to the bottom of your bag, causing you to unnecessarily hunch over and root around. 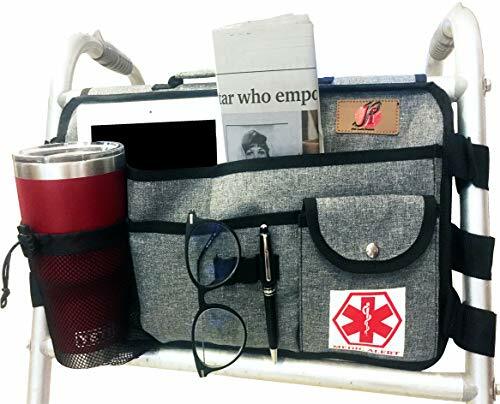 Our walker bag features three mesh pockets perfect for keeping your cell phone, pill bottles or sticks of gum handy at all times. Lightweight. Heavy Duty. Don t be fooled by our bag s lightweight. They can hold up to 11 lbs. without tearing or wearing on the velcro straps. EASILY CARRY & PROTECT YOUR ITEMS - Having both hands on a walker doesn't make it easy to carry much else. That's why we've designed our heavy-duty Pivit walker accessories bag for seniors with adjustable straps and more depth than the average walker bag to help you keep your personal belongings close and protected at all times. 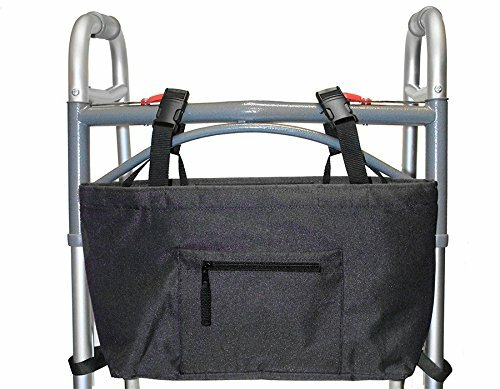 FITS ALL WALKERS - Each rollator accessory bag is designed to fit walkers with 1-inch diameter metal tubing, approximately 19-inches apart, and is made of a lightweight, yet heavy-duty polyester fabric. Don't let its lightweight design fool you, these waterproof tote bags can hold up to 11 lbs. of groceries, books, packages and more. WATER-RESISTANT & MACHINE WASHABLE - Rain or shine our basket bags will keep all your belongings nice and dry! Each shopping bag features an exterior stain- and water-resistant coating to keep your belongings inside clean and dry. Should you spill something inside the bag, it's machine washable and can be hung to dry. 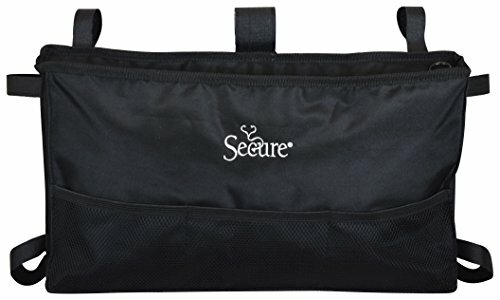 3 MESH POCKETS PLUS LARGE ZIPPER POUCH - Don't let smaller items like lipstick, pens, grocery lists, or cell phones sink to the bottom of your walker bag. Keep these items handy in one of the bag's three mesh pockets! Plus, it features a large zipper closure to help keep contents secure and private. INSTALL & REMOVE IN SECONDS - Each walker bag features four velcro straps for easy removal and attachment in seconds, with minimal physical effort. Once the velcro straps are in place, the bag will not detach from the walker until you peel the strips back to ensure secure fastening. Bags are certainly one accessory we can say, The More the Merrier! Mobility bags do so much more than carry your essentials and personal stuff they express your style, make a statement and are just so fun to have. And, since NOVA is obsessed with style, you ll find more looks, trends and thoughtful design here, than anywhere. PROTECT & CARRY your Rollator Walker, Folding Walker or Transport Chair with an extra-large carry bag - perfect for airline checking, carrying or storage. 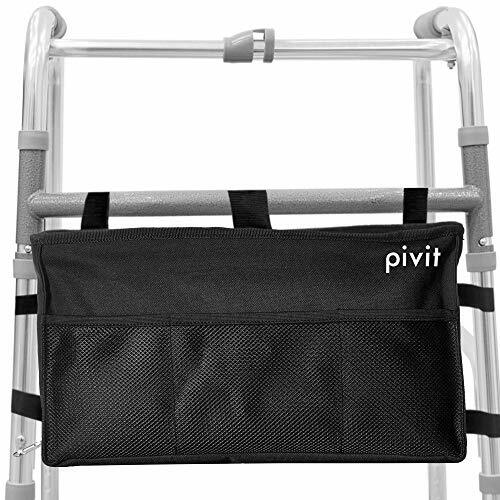 UNIVERSAL FIT FOR ALL ROLLATOR WALKERS and folding walkers (with the exception of the NOVA 4216 Mighty Mack Rollator). Handles on Rollator Walker must be removed prior to placing the unit in the bag. UNIVERSAL FIT FOR ALL TRANSPORT CHAIRS that have a fold down back. Will not work for transport chairs with a fixed back that does not fold down. Will not work for wheelchairs. HAS BOTH BAG HANDLES & SHOULDER CARRYING STRAP that is adjustable and removable. Dual full zipper closure with key rings make it easy to open and close. DIMENSIONS & MATERIAL: Bag Dimensions are 34W x 26.5H x 9.25D. Bag Material is durable Vinyl. Bag can be cleaned with a damp cloth. Warranty: NOVA has the best warranty and service program in the industry with a Limited lifetime warranty on all frames. 5 year warranty on handbrakes. 1 year on parts (including tires, seat, hand grips, basket etc.). NOVA's toll free consumer hotline is clearly printed on all products and user guides to provide our customers with excellent support! 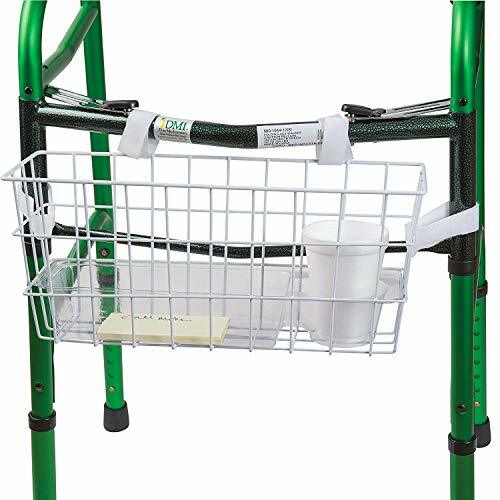 The Secure WKRB-6B Six Pocket Walker Storage Pouch is designed easily attach to the frame of any standard walker to keep essential items close at hand. The bag features seven hook and loop fastening straps to secure the bag to the top and side bars of a walker frame. Large expandable main pocket securely holds larger items and features an O-ring zipper pull for those with limited dexterity, while the front and back pockets provide quick access to smaller items. The bag is assembled using water-resistant nylon material that is durable, easy to clean, and made to withstand the rigors of continuous use. Covered by Personal Safety Corporation's exclusive one year full-replacement warranty against defects and workmanship. Secure by Personal Safety Corporation...The brand trusted by thousands of concerned care facilities across the US, Canada and Europe since 1991. Medical alert pocket - has a MEDICAL SYMBOL silk screened in red just below the lower outside. Easily take your medical information, your daily medical supplies and medications with you. 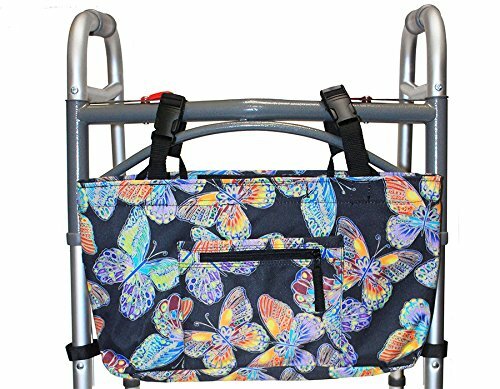 Work perfect for Folding Walker and Rollator Walker with basket. 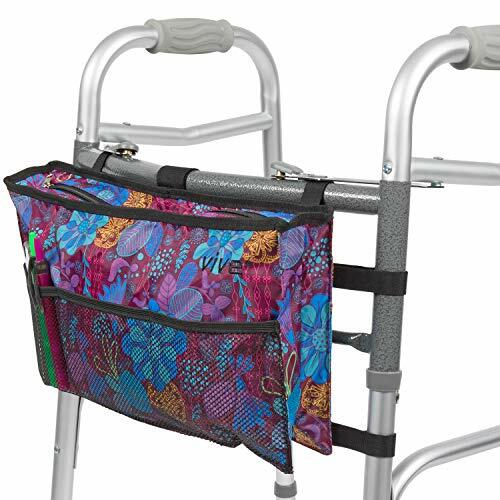 MEASUREMENT: 17"W x 10.5"H x 2.25"D - Side velcro strap 6.55"
Rest your purse, jacket, or shopping bag on your walker, rollator, or wheelchair with the ultra convenient Drive Medical Walker Rollator Accessory Hooks. These strong accessory hooks can hold up to 11 pounds and swivel a complete 360 degrees leaving both arms free to maneuver mobility aids. Use the 2-pack of accessory hooks with walkers, rollators, and wheelchairs to hold a purse, sweater, jacket, and shopping bags. Accessory hooks make operating a rollator, walker, or wheelchair easier and safer by keeping user hands free..
AdirMed s Wheelchair, Rollator, Walker and Scooter Pouch provides sufficient room for your personal belongs while you're on the go, yet is compact enough to attach securely to most walkers, rollators, scooters, wheelchairs and even onto some bikes . For convenience, the pouch secures to any crossbar or sidebar measuring 1 to 1.5 in diameter using the hook and loop Velcro closures. For your convenience, the pouch is available in a variety of color options , including black, blue, red, purple, pink, burgundy and yellow, sure to meet everyone's style or preference. It measures 10 wide, 5 high and 2 deep to provide ample space for your personal belongings when you're heading out. One big zippered pocket and one small zippered pocket provide secure places for your wallet, ID, money, medication and other items you don't want to lose. There are also three open pockets for other miscellaneous materials that you want easy access to, as well as a mesh bottle holder so you can conveniently have something to drink within hands reach. VERSATILE DESIGN. Featuring a universal design, this pouch can be secured to any crossbar or sidebar measuring 1" to 1 " in diameter. It attaches easily and securely with Velcro hook and loop closures, making it suitable for use on most walkers, rollators, scooters, wheelchairs, and even some bicycles. SUFFICIENT SPACE. The pouch measures 10 wide, 5 high and 2 deep to provide ample space for all of your personal belongings when you're on the go. A great accessory for men and women alike, this pouch is the perfect answer to carrying around your belongings when your hands aren't free to actually hold them.